FoxEye’s popular block-breaking game has been vastly powered up! Blast through six (6) land and ocean themed stages with 3 heroines, 15 illustrations, plus added strip patterns for 33 total unlockable works! Naturally all the unlocked works can be seen anytime in gallery mode! * Counterbalance anti-upgrades! Whoa! Anti-upgrades make your balls too fast, the bar shorter and the strength weaker! A twist on the classic breakout genre, these bad items turn simple gameplay into a frenzied challenge. To balance things out, you can choose counterbalance options like increased item drops, increased starter strength, etc. Choose from 1 of 3 types and turn chaos into chance! * All new special ball modes! In the old game you could get a temporary laser beam. Now you can get grenade balls, free balls, piercers and other unique upgrades. Twice as much variety for twice the fun. * Cheat mode?! 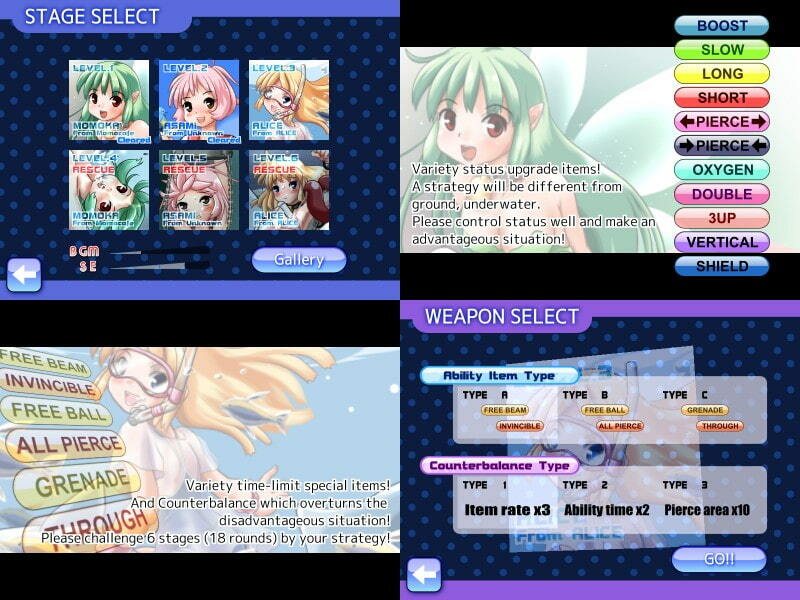 Once you unlock a certain number of CGs, when you start the game again you’ll discover a new option that lets you customize anti-upgrades and other features to make the game play exactly how you want! The 3 heroines were compiled from past manga and illustrations by FoxEye. Depending on popularity (and whim) we might turn other girls into game stages. This game is suitable for all ages, but be warned: it’s just BARELY!